I have three old black glass buttons that I'm going to sew in between the rows of beading...Lil Witchy-Poo will have such a fancy dress! Doesn't she look so pleased to be wearing her favorite Halloween finery? There's a few other little accents that I'd like to try (think glittery cording for stars)...but I'll save that for another time. Wowzers! Don't you absolutely love this rug? 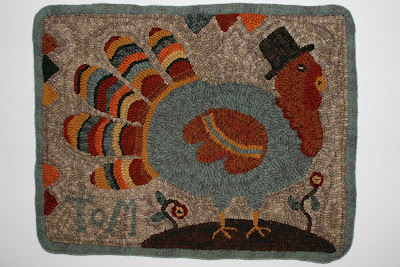 This is Tom, a new pattern adapted from Lori Brechlin folk art. It was hooked by my good friend, Vicki Monroe and it took her less than two weeks to complete! She used a lot of Rebecca Erb's textured wools. I like everything about this rug but especially the tail feathers. They are turkey-perfect! Another great possibility would be to dig into your left-over scraps and hook the feathers in a hit-or-miss manner. 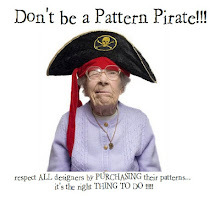 Then use some of those "tail colors" in the triangles along the border to pull it all together. Let your imagination run wild! Thanks, Vicki, for sharing your fun holiday mat! Lately I've been trying to get back to my rug hooking. The evenings are getting cooler and it's getting darker earlier. It feels more like fall which makes me want to sit down and hook in the evening when the day is done! I'm actually hooking two projects at the same time. I switch back and forth, depending on my mood; if I'm tired...or inspired! When I want a nice easy thing to hook, I work on Lion and Lamb. I am mixing three neutral textured wools for the background. The mixture gives so much more interest to the background than if I just used one. I like to work on the background because it doesn't require a lot of thinking...just cut up equal amounts of the three wools, toss them together in a plastic bag, and pull out strips randomly to hook. I hook round and round, echoing the shapes of the leaves and the animals....a great way to get a nice soft movement to the background. Here's a close-up of the lamb...I used a nubby textured off-white wool and outlined with a soft gray boucle. Here's a close-up of the lion. I am really pleased with the way his mane hooked up. I used a gold striped wool and cut it along the stripes. Then I hooked the wool in, being careful to place the stripes in such a way that they didn't blend with each other too much. Voila! Getting back to my rug hooking frame has made me take inventory of all the unfinished rugs that are waiting to be completed. I tried to count...not figuring in the rugs that were completed but not hemmed (hey, the hooking part is completed, right? )...I determined that I had 5 unfinished rugs. Oops! Then I ran across another one in my wool closet so that made 6! It's OK, I know I'll finish them at some point. I love them all and they are just waiting for me to come back to them. So how many unfinished rugs do you have? It's OK, you can confess! No one will know! Take part in my poll. It will be fun to see what the results are! Hurricane Ike (ok, "tropical depression Ike") has passed just to the south of us today and has given us torrential downpours and cold gusty winds. We have already had too much rain this week-end! Our pond has overflowed its banks and there is low-lying flooding. We lost power for 18 hours...and the lights just dimmed again a few minutes ago. Are we in for another dark night? Michiganders are not used to this hurricane stuff! The goats and sheep are hunkered down in their little shelters, trying to stay out of the worst of it. They are probably soaked to the skin. I hope you stayed dry this week-end! My sister and I drove up to Michigan's Upper Peninsula at the beginning of the week. We came across this sign in a park at the Mackinaw Bridge and I just had to laugh! I think this picture needs a witty caption but I can't come up with anything appropriate. Leave me a comment with your captions and I'll pick the one that I like the best. Ready? Set? Start leaving those captions!!! "Do goats really eat tin cans?" This question usually comes up after I've been talking to someone for a while and they find out I have angora goats. I don't know why folks automatically connect goats with tin cans, except that maybe we all watched too many cartoons when we were younger. My answer to them is "No, they don't eat tin cans but....."
The best way to describe goat behavior is to compare them to a three-year-old child. They are constantly curious, always exploring, touching, tasting, and fiddling with things....except goats don't have little fingers like a three-year-old, so they use their mouth. How else could they explore the world around them? Zack (pictured above) is the master of chewing and "fiddling." He's learned to unlatch the gate (from the inside-thus we have double latches), he chews on my shirt and shoes or any loose thread on my jacket, and he's been known to take off with a stray paper towel or a pair of scissors. One of my older goats used to pull my husband's screw driver out of his tool belt (while my husband was wearing it!) and he'd turn and run as fast as he could across the pen. Trust me, goats love the chase and it's hard to get that stuff back once it's in their mouth! I imagine that a tin can might contain some remnants of tasty food or maybe the label has been stuck on with some yummy glue. Or maybe it's just shiny and interesting to touch. So to answer the proverbial question...no, goats don't eat tin cans....but they would probably chew on it instead! And the wire fence tastes good too...especially with a fresh crunchy coating of icicles! That's Zack's twin brother, Zion, on the left. He's the Second Commander of the Chewing Brigade.